Mykonos to Santorini in 2017. The complete guide. The most popular ferry route in the Greek islands is the one connecting Mykonos to Santorini and Crete. The ferries operating this route also stop in Paros and Ios. Some, like the Seajet 2 also stop in Naxos. For 2017, the Mykonos to Santorini ferry connection will start on the 24th of March with the Seajet 2 daily schedule. Hellenic Seaways will follow, with a daily Highspeed 7 schedule, from the 7th April. From then onward, the frequency will increase to up to five daily schedules. 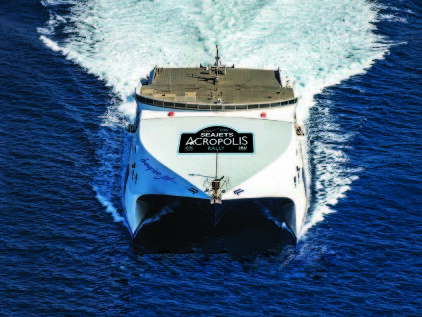 This year, the ferry operators connecting Mykonos to Santorini are Hellenic Seaways and Seajets. 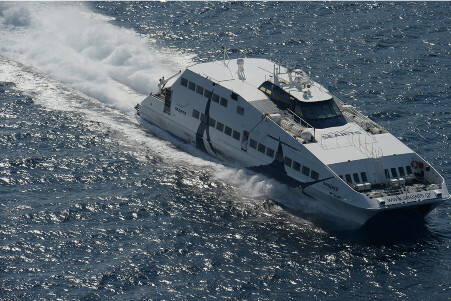 Both ferry companies operate high speed ferries. The ferry route from Mykonos to Santorini is part of the Mykonos to Crete route which includes Mykonos – Paros – Naxos – Ios – Santorini – Heraklio, Crete. The route is operated by high speed ferries and the travel time is between 2 and 3 hours. From 07/04/2017 until 15/10/2017 Daily at 13:50 with the Highspeed 7. Arrival in Santorini 16:30. From 24/04/2017 until 11/06/2017 Daily except Tuesday & Wednesday at 10:50 with the Hellenic Highspeed. Arrival in Santorini at 13:25. From 12/06/2017 until 24/09/2017 Daily at 10:50 with the Hellenic Highspeed. Arrival in Santorini at 13:25. From 24/03/2017 until 18/05/2017 & from 01/10/2017 until 16/10/17 & from 24/10/2017 until 31/10 /2017 Daily at 10:00 with the Seajet 2. Arrival in Santorini at 11:50. From 08/06/2017 until 30/09/2017 Daily except Sundays at 18:30 with the Seajet 2. Arrival in Santorini at 19:45. From 19/05/2017 until 24/09/2017 Daily at 09:50 with the Champion Jet 1. Arrival in Santorini at 11:55. From 07/04/2017 until 16/10/2017 Daily at 15:35 with the Champion Jet 2. Arrival in Santorini at 16:20. From 22/05/2017 – 31/05/2017 Mondays, Tuesdays, Wednesdays & Thursdays at 18:15 with the Superjet. Arrival in Santorini at 21:25. From 25/09/2017 until 30/09/2017 Daily at 09:50 with the Superjet. Arrival in Santorini at 11:55. From 07/04/2017 until 15/10/2017 Daily at 11:00 with the Highspeed 7. Arrival in Mykonos at 13:30. From 24/04/2017 until 11/06/2017 Daily except Tuesdays & Wednesdays at 13:40 with the Hellenic Highspeed. Arrival in Mykonos at 16:45. From 12/06/2017 until 24/09/2017 Daily at 13:40 with Hellenic Highspeed. Arrival in Mykonos at 16:45. From 24/03/2017 until 18/05/2017 daily at 12:15 with Seajet2. Arrival in Mykonos at 14:20. From 08/06/17 until 11/09/2017 on Mondays, Thursdays & Fridays at 12:45 with the Seajet 2. Arrival in Mykonos at 16:10. From 12/09/2017 until 30/09/2017 daily except Mon & Fri at 13:00 with the Seajet 2. Arrival in Mykonos at 16:25. From 01/10/2017 until 16/10/2017 daily at 14:15 with the Seajet 2. Arrival in Mykonos at 16:25. From 17/10/2017 until 31/10/2017 Daily at 12:15 with Seajet2. Arrival in Mykonos at 14:35. From 17/10/2017 until 23/10/2017 daily at 18:15 with the Seajet 2. Arrival in Mykonos at 20:25. From 19/5/17 until 24/09/2017 daily at 12:15 with Champion jet2. Arrival in Mykonos at 14:25. From 07/04/2017until 16/10/2017 Daily at 10:45 with Champion jet 2. Arrival in Mykonos at 13:05. From 20/05/2017 – 31/05/2017 Daily except Monday at 09:00 with the Superjet. Arrival in Mykonos at 12:15. From 25/09/2017 until 30/09/2017 Daily at 12:15 with Superjet. Arrival in Mykonos at 14:20. 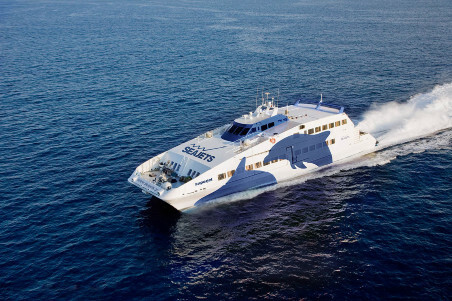 The ferries connecting Mykonos to Santorini are all High Speed catamarans, mono hauls or small hydrofoils. All take between 2 and 3 hours. Travel time depends on the speed, on the number of stops and of course on the weather. 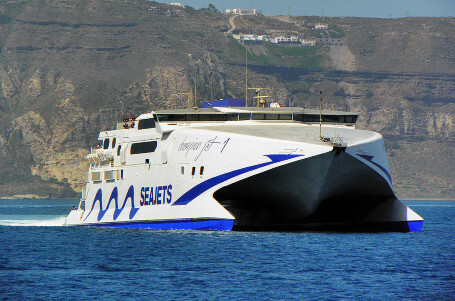 The Seajet 2 connects Mykonos to Santorini in 2h 05min. The Champion Jet 1 connects Mykonos to Santorini in 2h 10min. The highspeed 7 connects Mykonos to Santorini in 2h 40min. The champion Jet 2 connects Mykonos to Santorini in 2h 45min. The Superjet connects Mykonos to Santorini in 3h 10min. How much is the ferry from Mykonos to Santorini? Which ferry connecting Mykonos to Santorini should i choose? Since the travel time and prices are quite similar for all ferries connecting Mykonos to Santorini, your main concern would be first of all if you are traveling with a vehicle and then the departure time, availability, the weather conditions and the reliability. Traveling with a vehicle: The Seajet 2 and the Superjet are passenger only ferries. All others take vehicles. Departure time: As you have seen above there are schedules both in the morning and the afternoon. 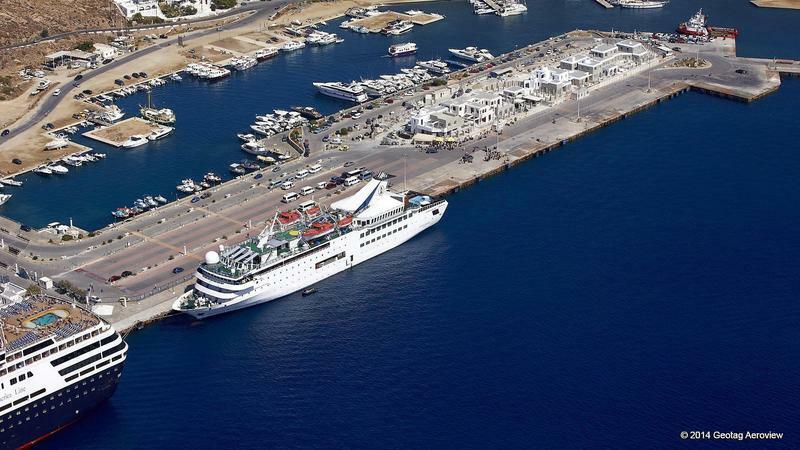 Availability: The popularity of this route and the smaller size of the ferries operating the Mykonos Santorini connection means that you might not always find availability for your first choice. You should probably book in advance if you are traveling in July and August. Weather conditions: During the summer, very often, there are strong Northern winds in the Aegean. This means that you might have a bumpy ferry ride. Especially if you are traveling from Santorini to Mykonos. The Seajet 2 and the Superjet are small hydrofoils and are less sea worthy compared to the larger catamarans and mono-hauls. Also keep in mind that rough seas might delay ferries as they cannot cruise at great speed. You can check the wind conditions on our blog here. Reliability: Traveler reviews suggest that the most reliable service is by the Highspeed 7. As mentioned above, many parameters can affect timings. The weather, how fast passengers and vehicles go in and out at every stop, etc. A call at the ferry operators central agency at your departure time can save you some time. 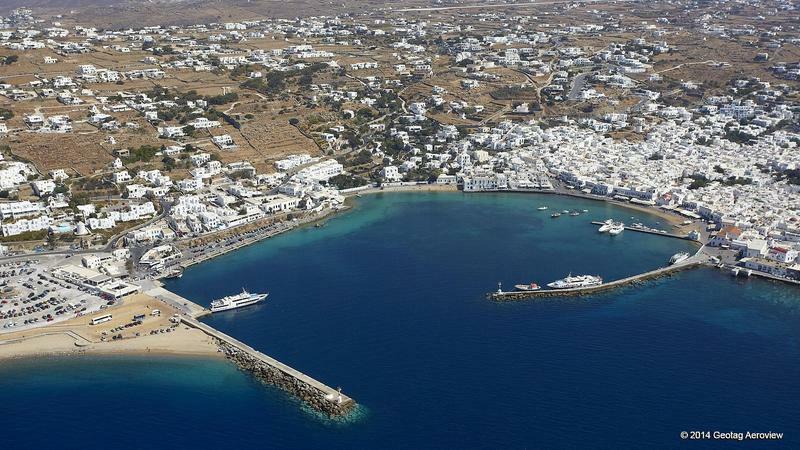 Mykonos has two ports, the old port next to the main village “Chora” and the new port which is 2 Km further away. All car passenger ferries, both conventional and catamaran, dock at the new port. Only the small Seajet 2 and the Superjet hydrofoils dock at the old port. The old port of Mykonos can be easily reached by foot from the main village. That is not the case with the new port. Travelers, especially those with small children and carrying luggage, should have this in mind. There are buses to the new port and of course taxis. There is also a Sea bus connecting “Chora” to the new port every 30 minutes. At both ports there are waiting areas and a place to grab a drink or a snack. There are travel agencies in the main village and above the old port. At the new port, there are some ferry ticket pick up points booths. When you arrive in Santorini, the ferry will dock in Athinios, the ferry port of the island. Its a small port and it gets very busy when ferries arrive. There are buses meeting the ferries to the island’s capital, Fira. There are also taxis, but not enough for everyone. The bus network in Santorini is quite good and you can fairly easily reach your hotel. Fira, the capital is the starting point for all buses. In Athinios port, there are some restaurants and travel agents. Keep in mind that ferries, especially the fast small ones, only dock for a few minutes. You should rush your way out of the ferry when you arrive. It will also help you get a sit on the bus. There is no direct bus from the port of Santorini to Santorini airport. Do you know when the Hellenic Highspeed 10:50 departure will be listed on their website for sale? I’m traveling on 1 July from Mykonos to Santorini and I only see the 13:50pm departure listed. Kristin hi. 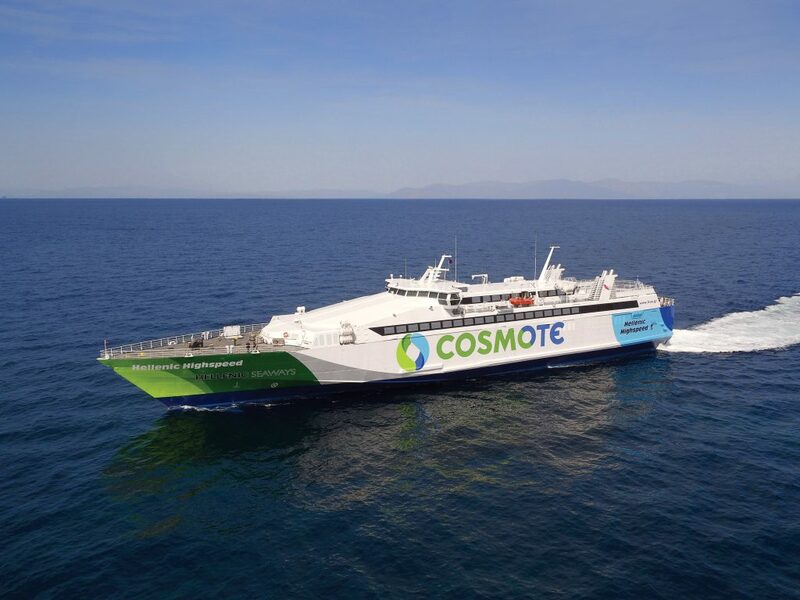 Hellenic Highspeed will no longer sail between Mykonos and Santorini. Hellenic Seaways decided to cancel the schedule few days ago. (http://blog.danae.gr/2017/01/27/hellenic-highspeed-cancellations/). There are five different ferries sailing from one island to the other. Kindly check our web site http://www.danae.gr or send us and email at info@danae.gr if you need further information. Under which does Hellenic Seaways Highspeed 7 fall? Old port or New port in Mykonos? Hello Elizabeth and thank you for your comment. Highspeed 7 arrives and departs from the NEW port of Mykonos. Let me know if you need further information. Hello. We will be traveling from Santorini to Mykonos on october 14th, 2017 (4 people with luggages and no car). What will be the best recommendation in terms of ferries for that time of the year. Hi, I´m traveling in November to Greece, I want to travel from Mykonos to Santorini, but I can´t find ferry, do you know if there is a way to go from Mykonos to Santorini in November.